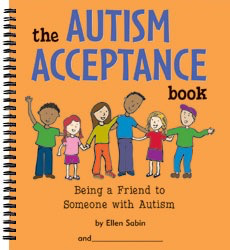 THE AUTISM ACCEPTANCE BOOK: BEING A FRIEND TO SOMEONE WITH AUTISM is an interactive, educational and character-building book that introduces children to the challenges faced by people with autism while also supporting their personal journey toward appreciating and respecting people's differences. The 62-page spiral-bound book offers educational information, conversation-starters, and engaging exercises that invite children to “walk in someone else's shoes” as they learn to treat others the same ways they would like to be treated themselves. While focusing on autism, ultimately, this book teaches broad life lessons about accepting and embracing people’s differences. This book has been valued and shared widely. It’s been used by the United Nations to help launch the first World Autism Awareness Day, by Autism Speaks as the First National Walk Sponsor, and in many schools, communities, and households to foster acceptance for people with autism. The Autism Acceptance Book grows kids with character by: Helping them understand that everyone is different and has unique talents and challenges. Encouraging them to take the time and make the effort to understand and respect others. Offering exercises that encourage them to practice empathy and compassion. Building a better understanding of autism and how people with autism might interact and react in certain situations. Broadening their experiences by showing them that all friendships are different and can be rewarding in many ways. Building their self-esteem by helping them understand the power of their actions and their ability to be kind, compassionate and helpful. Why The Autism Acceptance Book is SO important… Autism is a growing problem that afflicts thousands of children every year. Children with autism face many challenges and obstacles. These children will have an easier time navigating the world if the people in their lives take the time to understand them better. Children who do not have autism live in a world full of people who are different from each other in all sorts of ways. It isn't always easy for children to understand and accept people that seem different or behave in ways they find unfamiliar. When children learn more about people with autism, they will be supporting their peers, making new friends, and strengthening their own character. This book is ideal for use in classrooms, camps, and other group settings.